Carson City Symphony was founded in 1984 as the Carson City Chamber Orchestra and gave its first concert in October that year. It is a community orchestra open to amateur and volunteer professional musicians. Members come from all walks of life and have ranged from elementary school students to senior citizens. The Symphony performs five or more concerts each year for audiences in Carson City. It also has performed in Minden, Gardnerville, Fallon, South Lake Tahoe, and Virginia City. We play many works by contemporary composers and have commissioned and premiered several pieces. The Carson City Symphony Assoc. is a member of the Carson City Downtown Business Assoc. Carson City Symphony's Youth Strings ensembles, Not Quite Ready For Carnegie Hall Players adult intermediate string ensemble, and Joyful Noise Carson Children's Choir will perform a "Music is for Life" concert on Thursday, April 25, 2019, 6:30 p.m., at the Carson City Community Center, 851 E. William Street. Directors are Sue Jesch, Laura Gibson, and Nancy Jones. This family friendly concert is open to all, and admission is free. The concert will feature performances by students from grade 2 through high school, including beginning violins; the Allegro, Vivace, and STRAZZ youth strings ensembles; the adult ensemble; and the children's choir, ages 4 to 12. 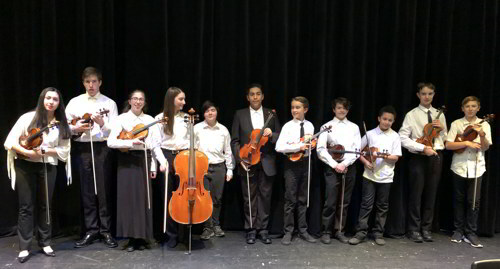 Highlights include the beginning violinists playing "Twinkle Boogie," intergenerational strings with children's choir performing "Morning has Broken" and "This Little Light of Mine," and advanced strings featuring graduating seniors Emma Rosen and Eleanor Sturm on violin and Gabe Covington, mandolin. Symphony Youth Strings is Carson City Symphony Association's tuition-free, after-school program for young string players. The Symphony's Not Quite Ready for Carnegie Hall Players (NQR) is open to all adult intermediate-level string players. Both programs were founded in 2005 by Education Director Sue Jesch. Laura Gibson is violin and ensemble instructor; Lou Groffman is STRAZZ and cello instructor. About 75 students currently participate. Joyful Noise Carson Children's Choir was founded by Nancy Jones and affiliated with the Symphony Association in 2017. Carson City Symphony Association's programs are supported, in part, by public funds through grants from the Nevada Arts Council and National Endowment for the Arts, the D'Addario Foundation, and by private donations. For more information about the strings programs, see CCSymphony.com or call Sue Jesch at 775-450-5584. For information about the children's choir, call Nancy Jones at 775-400-1436. Photo: Symphony Youth Strings advanced student ensemble, STRAZZ, performed at the Community Center in November and will play in the April 25 concert, Music is for Life. Violinist Gregory Maytan returns to perform the Amanda Maier Violin Concert with the Carson City Symphony in the newly renovated Bob Boldrick Theater in the Carson City Community Center in a concert called "Family Matters." The concert is on Sunday, April 28, 2019. It starts at 4:00 p.m. Gwyneth Walker's "Fanfare for the Family Farm," Florence B. Price's "Symphony No. 3," and Julius Röntgen's "Oud-Nederland" are on the concert. Röntgen was Amanda Maier's husband and a composer. Tickets are $15 general admission; $12 for seniors, students, and Symphony Association members; and free for youth age 18 and under. Tickets are on sale at the Nevada Day Office, 716 N. Carson St., online at CCSymphony.com (see "BUY NOW" button, below), or at the door (cash or check only). The Symphony's 2018-19 concert season is supported, in part, with public funding through the Nevada Arts Council and the National Endowment for the Arts. The concert preview is funded in part by Nevada Humanities and the National Endowment for the Humanities. This concert is supported in part by the Women's Philharmonic Advocacy, a non-profit organization founded in 2008 in order to recognize the achievement of The Women's Philharmonic (1980-2004) over their 24 years of activity, and build on this work by advocating for the performance of women composers by orchestras and ensembles. For information, see CCSymphony.com or call 775-883-4154. Suggested listening for April 28, 2019, Concert. Minnesota. Dr. Kevin Sütterlin, Music Director. October 2018. 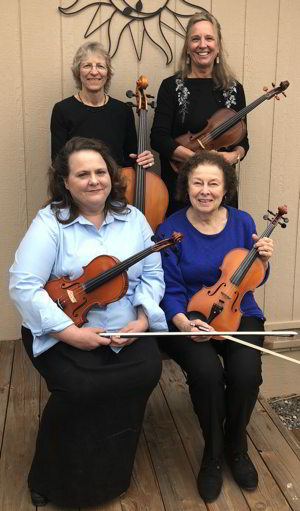 The Silver Strings string quartet, an affiliate of the Carson City Symphony, has a busy schedule in April and May. The Silver Strings play on Thursday, April 4, 2019, at 4:30 p.m. for the opening of the new Carson-Tahoe Care Center on Mountain St., Carson City, just south of the old hospital. The Silver Strings play on Saturday, April 6, 2019, from 1:30 to 3:30 p.m. in the Nevada Artists Association (NAA) Gallery in the Brewery Arts Center building, 449 W. King St. The group is representing the Carson City Arts & Culture Coalition on the Wine Walk, which will be hosting it's wine-tasting table in the NAA Gallery. The Wine Walk is on the first Saturday of each month from 1:00 to 5:00 p.m. For information about the Wine Walk, see www.downtowncarson.org. The Silver Strings play on Thursday, May 10, 2019, for Western Nevada College's (WNC's) Mother's Day Gala Fundraiser at the Carson Nugget. The whole event, for adults only, starts at 5:00 p.m. and ends at 11:00 p.m. The quartet will be playing from 5:00 to 6:00 p.m. (details subject to change). Come and enjoy a glamorous evening to honor the moms in a very splendid way! Formal wear is highly encouraged. Tickets are $50 per person in advance or $55 at the door. To purchase tickets, contact Lupe Ramirez at 775-445-3215. You must make reservations by May 1, 2019. 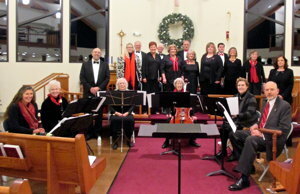 Consort Canzona, the early music group of the Carson City Symphony Assoc., will present a pair of concerts at Shepherd of the Sierra Lutheran Church in Carson City (near Best Buy, south of Topsy Lane) on Friday, May 3, and Saturday, May 4. Friday's concert will be at 7:00 p.m. and the Saturday concert will be at 4:00 p.m. Admission to both concerts is free. Consort Canzona's Facebook page can be found at https://www.facebook.com/ConsortCanzona. It is an ensemble in the Carson City Symphony Association family dedicated to bringing early music (Baroque and earlier) to the Carson City area. You can see our February 2019 Newsletter online. Just click on the image at right. Thurs., April 25, 6:30 p.m. - "Music is for Life" - Symphony Youth Strings conducted by Laura Gibson and Lou Groffman. Concert also involves Joyful Noise Carson Children's Choir and Not Quite Ready for Carnegie Hall Players. Free. Sun., April 28, 4:00 p.m. - Carson City Symphony with Gregory Maytan, violin, Violin Concerto by Swedish composer Amanda Maier. Fri. & Sat., May 3 & 4 - Consort Canzona Concerts at Shepherd of the Sierra Lutheran Church. Free. Thurs., May 10 - Silver Strings play for Western Nevada College's (WNC's) Mother's Day Gala Fundraiser at the Carson Nugget. Sun., June 9, outdoor Pops Party concert - Carson City Symphony & Chorus at the Capital Amphitheater. Guest soloist, Tom Miller. Free. Thurs., July 4 - Mormon Station Park - Genoa Americana Celebration begins 10:30 a.m. Carson City Symphony & Chorus begins at 4:30 p.m. Guest soloist, Tom Miller. Free. Sun., Oct. 20, 2019 - 4:00 p.m. - Carson City Symphony Concert at the Community Center. Sun., Dec. 15, 2019 - 4:00 p.m. - Carson City Symphony "Holiday Treat" Concert at the Community Center. Sun., Feb. 23, 2020 - 4:00 p.m. - Carson City Symphony Concert at the Community Center. Sun., April 26, 2020 - 4:00 p.m. - Carson City Symphony Concert at the Community Center. A Sunday in June, 2020 - Carson City Symphony Concert Pops Party Concert. Location TBD. Sat., July 24, 2020 - Carson City Symphony Concert in Genoa. Sun., Oct. 25, 2020 - 4:00 p.m. - Carson City Symphony Concert at the Community Center. Sun., Dec. 13, 2020 - 4:00 p.m. - Carson City Symphony "Holiday Treat" Concert at the Community Center. Discount Flex Pass -- Can't commit to concerts dates in advance? Get a Flex Pass! Flex Pass tickets are good for four admissions to any Carson City Symphony and Carson Chamber Singers concert(s). You may use the pass any way you choose: bring four people to one concert, two people to two concerts, etc. Season tickets and flex passes are on sale now. Call 775-883-4154 or download a PDF form from here and just mail it in with your check. Interested in being a member of the Carson City Symphony Association, and support all our non-profit work? Just download a membership form in PFD format from our here and mail it in with your check. It will be appreciated. To join the Carson City Symphony or Carson Chamber Singers, call 775-883-4154. For Association membership information, click here. For feedback that we have received on Carson City Symphony concerts, click here: reviews. Read about Carson City Symphony's Symphony Youth Strings program. This season's concerts have been made possible, in part, by a grant from the Nevada Arts Council, a state agency, and the National Endowment for the Arts, a federal agency. The orchestra is a licensee of ASCAP and BMI, and a member of the (click here) and the League of American Orchestras. David C. Bugli, Music Director and Conductor, has a Bachelor of Science Degree in music education from Ithaca College, New York, where he studied composition for four years with Karel Husa. He has a Master of Music Degree from the University of Massachusetts. In addition to conducting, he plays classical and jazz piano, tuba, and trombone, and he composes and arranges music. He was also an adjunct faculty at Western Nevada College. Send us your comments from this page. Most Symphony rehearsals are on Wednesday nights (late August through late May), 7:00 p.m. to 9:15 p.m., in the band room at Carson High School, 1111 N. Saliman Rd., Carson City. Map. The Carson Chamber Singers is a choral group that has been associated with the Carson City Symphony since 1985. The Carson City Symphony Chorus is a larger version of this group. For chamber music, see the Silver Strings. 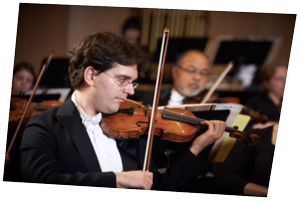 For youth string programs, see Symphony Youth Strings (formerly Strings in the Schools). For information on events at the Brewery Arts Center, click here. Carson City Symphony is funded, in part, by the Nevada Arts Council, a state agency, and the National Endowment for the Arts, a federal agency; Carson City; Nevada Humanities, the National Endowment for the Humanities, Carson City Cultural Commission, the Community Foundation of Western Nevada; and private donations. This website is maintained by and for the Carson City Symphony Association, Inc., and its affiliate groups. or use this e-mail address: Dcbugli@aol.com. Put "CCSymphony Website" in the subject line.